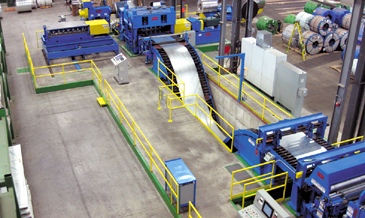 Longview, WA - Cascadia Metals, a multi-location ferrous and non-ferrous coil and sheet distributor and processor headquartered in Vancouver, BC, installed a new Hydraulic Cassette Leveler/Electronic Servo Feed Cut-to-Lenth Line at its Longview, WA coil processing and metal distribution plant. The state-of-the-art CTL Line levels and shears a wide range of products and gauges that include hot rolled, cold rolled, and galvanized carbon steel, aluminum alloy, and pre-painted steel & aluminum coils in gauges from .028" through .250" in widths from 12" through 72". 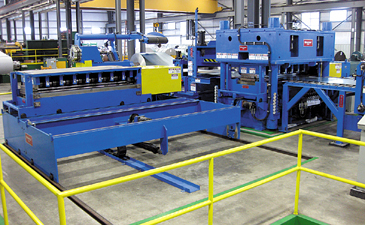 The Longview, WA Cassette Leveler CTL is Cascadia's second Braner/Loopco. Both 72" Hydraulic Cassette Levelers are equipped with 3.000" x 17-roll x 4-Hi and 1.750" x 17-roll x 5-Hi Cassettes that enable Cascadia Metals to produce panel-flat sheets in gauges from 1/4" to .028". Master coils staged on Cascadia's 4-Station Storage Table show the versatility of the new CTL. 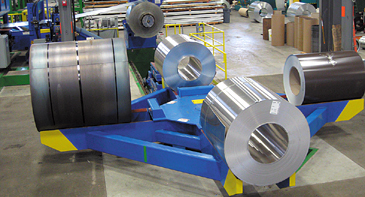 Two aluminum alloy coils, a hot rolled, and a thin-gauge pre-painted coil are in the queue awaiting the tail-out of a galvanized coil being processed. 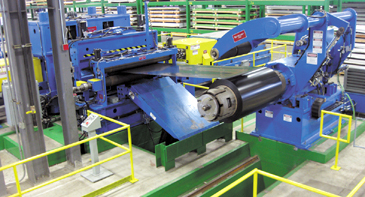 60,000# x 72" wide master coils are transferred via Coil Car from the Storage Table to the Uncoiler. A laser aligns the coil on the Uncoiler while a fiber optic Edge Guide maintains coil alignment while running. 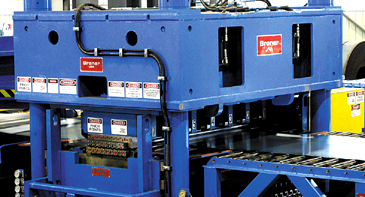 A Crop Shear prepares the coil head end for threading and "splits" coils that are partial runs. Cascadia's massive 4-post "Hydraulic Plunge" Leveler employs hydraulic cylinders, rather than screw jacks and sliding wedges, to position back-up flights for leveling. Computerized linear voltage transducers precisely position each cylinder independently. Adjusting entry and exit end cylinder elevations causes the work rolls to be tilted front-to-back for coil-set and cross-bow corrrection. Adjusting cylinder elevations from side-to-side creates roll-bending necessary for edge-wave and center-buckle correction. Braner/Loopco Hydraulic Levelers feature full automatic set-up based upon coil gauge and yield strength parameters, or automatic set-up via order recall menu. Leveler calibration is accomplished by pushbutton without tools. Cascadia's Hydraulic Plunge Leveler employs exchangeable Cassettes to level the full product and gauge range. 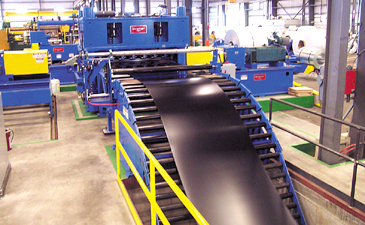 A 3.000" x 17-roll x 4-Hi Cassette is installed when leveling heavy-gauge coil, and a 1.750" x 17-roll x 5-Hi Cassette is used when leveling thinner gauge pre-painted surace-critical coil. Cascadia can exchange Cassettes in about 2-minutes. Each Cassette contains work rolls, intermediate rolls, back-up flights, and universal shafts that drive all Cassette work rolls. Maintenance on all the Leveler working and wear parts is accomplished outside the Leveler frame, which makes cleaning and maintaining the Leveler easy and fast. Cassettes can be opened like a book to expose and make easily accessible the work rolls, back-up rolls, and other parts that require periodic maintenance and cleaning. Periodic roll cleaning and other maintenance is accomplished while the CTL is operating with another Cassette.